The Marilyn Davies College of Business at University of Houston-Downtown was originally founded in 1974 when the University of Houston acquired the assets of South Texas Junior College and opened at One Main Street in downtown Houston, Texas. UHD’s College of Business was founded in 1991, and in January 2012 it enrolled its first class of MBA students. In cooperation with another beloved Houston institution, UHD has held commencement ceremonies since 2002 at Minute Maid Park, the downtown home of the Houston Astros major league baseball team. 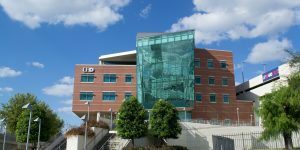 The UHD School of Business received accreditation from the Association to Advance Collegiate Schools of Business in 1994. Davies comprises five buildings on 24 acres near the Buffalo and White Oak bayous on the north end of downtown Houston, the fourth-largest city in the United States. Two of the buildings are of notable historic importance, while others are new construction. The area is served by Houston METRO, a rail, trolley and bus transit service. Davies also operates a teaching center at the Lone Star College-University Park, which is about 30 minutes northwest of the Houston city center. Davies MBA students take classes at the architecturally stunning and award-winning Shea Street Building, which opened in 2007 to house UHD’s School of Business. The 150,000-square-foot building features a glass-encased, four-story entry that offers expansive views of downtown Houston. The facility provides digital connectivity throughout classrooms, lecture halls and computer labs and has led to revitalization of a previously depressed area just outside Houston’s central business district. An adjacent 600-spot garage makes parking easy for students, faculty and staff. Nearly 100 faculty members teach courses at Marilyn Davies College of Business at University of Houston-Downtown. Of those, 67 are full-time. Eighty percent of the College of Business faculty members have earned a doctoral degree, and, reflecting Houston’s diverse population, many are multi-lingual. An estimated 1,069 students are enrolled in the Marilyn Davies College of Business at University of Houston-Downtown. UHD Davies offers a full-time and part-time MBA program.